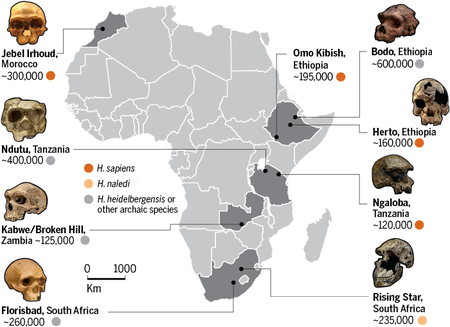 You’ve probably heard that modern humans evolved in Africa. This is true, but not the most useful answer. After all, Africa is a ruddy big place1. So, can we be any more specific? We know our species evolved in Africa sometime in the last half a million years. The evidence for this is overwhelming. In fact, it just might be too overwhelming. See, we’ve got a fair few fossils from this time period. Most recently, we found some human fossils in Morocco. These were some of the oldest found, so are a bit different to us, as you might expect. They have a larger face with a jaw that sticks out and prominent brow ridges. Their braincase is long and low, similar to earlier human species1. Meanwhile, in East Africa, we’ve got the Omo Kibish fossils. One has a big brow ridge, like the Moroccan skull, but their brain case is tall and round, more like ours. Another fossil is the reverse, featuring a long, low brain case but much-reduced brow ridges. Elsewhere in Ethiopia, the Idaltu fossils have a weird hybrid braincase, being both round like ours yet long like the other hominin species. This combines to give them one of the biggest brain sizes ever recorded1. Then we get to South Africa, where we’ve found a skull at Florisbad. It’s got the big face of the Moroccan skull, but the brow ridges are less prominent. Other fossils from the region follow yet a different pattern, mixing and matching brow ridge prominence, degree the jaw sticks out, and skull shape1. And these are just the fossils I can be bothered to describe. There’s many more out there, each with a slightly different combination of traits1. Starting to see what I mean by too much evidence? It’s all over ruddy Africa! To make it more confusing, each population seems to be taking a different evolutionary route1. Which, if any, led to us? It seems there’s no clear frontrunner for the location where modern humans evolved. We’re not even sure what evolutionary route they took. But maybe that’s the point. What if humans evolved all over Africa? This is the hypothesis put forward in a recent paper by Scerri et al. They suggest that there were little pockets of early Homo sapiens all over the continent. Every so often these pockets might meet and share DNA (as humans love to do) but were otherwise fairly isolated. Somewhere amongst all this mess, we evolved. Bits and pieces of us evolving, spreading, and combining across a whole continent over hundreds of thousands of years2. Scerri et al.’s hypothesis help to explain all this weird anatomical variation we see across early Homo sapiens in Africa. We also see similar regional patterns in technology from this time. Which again, makes sense if we’re dealing with a bunch of isolated groups of people2. But as well as just explaining stuff, this hypothesis also raises some interesting possibilities about our evolution. See, we know early Homo sapiens weren’t the only bunch of humans running around Africa at this time. The recently discovered Homo naledi was in South Africa during this period, and there may have been some Homo erectus and Homo heidelbergensis elsewhere2. Memorising all those names and places isn’t that important. What is important is that if we’re dealing with a bunch of isolated human groups who occasionally bumped into each other, maybe some of us also bumped into those other species. In more ways than one, if you know what I mean2. Modern humans are the odd ones out in the human family, with weird round heads and a prominent chin. Maybe a unique pattern of hybridisation – both with our multiregional groups and other species – explains our unique features2. This is just one fascinating possibility that’s raised – and could be used to test – this new hypothesis. What brought these divided human populations together? Perhaps environmental change opened up or closed off corridors between us. How old is our species? And where did it we first come from2? Our origin may be way more complicated than we ever thought. But that’s super exciting. Scerri, E.M., Thomas, M.G., Manica, A., Gunz, P., Stock, J.T., Stringer, C., Grove, M., Groucutt, H.S., Timmermann, A., Rightmire, G.P. and d’Errico, F., 2018. 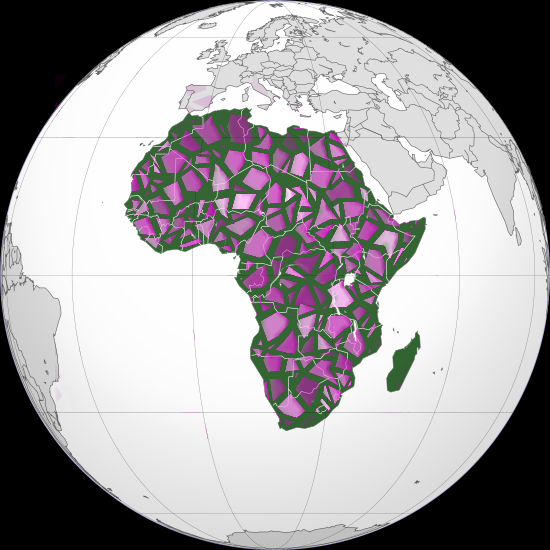 Did our species evolve in subdivided populations across Africa, and why does it matter?. Trends in ecology & evolution. Genetically, I don’t think there has ever been more than one species of Homo. There just hasn’t been enough time over the past 2.6 million years for any regional population to become genetically isolated long enough from other regional populations for speciation to occur within the genus Homo. Frequent gene flow between regional populations have pretty much kept Homo one species, IMO. Regional populations of Homo, including Neanderthals, should probably be referred to as subspecies of Homo. amongst 7% of black Africans ( Live Science) of which the original Hominid source has not yet been discovered. Apparently this gene relates to fluids in the nose that assists in the better management of breathing in drier climates. One wonders of course what other gene variations is still going to be discovered. When living in Africa it becomes quite obvious that one ridiculous mistake people make, is to just accept that black people are all just the same and do not distinguish like we do between, say, the Brits and the French in terms of culture and behavior. so, then again, the mixtures that were bred up in that area, could later have been spread around Central Africa and Europe again ? As for my subjective self, I think one can distinguish the genes in facial features among’st African peoples.. Amongst other interesting questions, one wonders whether Erectus moved in and out of Africa or survived here for on 2 million years and what influence that would have had ? And then of course, what was the exact origin of the Neanderthal. It seems there is not really any data of significance on that. A guess would be that one could have had two ” types” of Erectus and that early African Erectus/Sapiens line moved into Europe and developed into the Neanderthal ? One of course wonders what the studies of genetics indicate at this time? The primary question being whether the genetic line stayed narrow enough for inter breading all these years ? There does seem to e logic to it. Thanks for your comments Andre! The loss of genetic variation in Eurasian populations relative to African populations suggest that Eurasians are probably derived from a small regional East African population. Such ancient human ancestors could have left Africa through Egypt during an interglacial period starting around 2.1 million years ago. But the earliest Eurasian populations could have been semi-isolated from Africa much earlier if they crossed into the southern region of the Arabian peninsula during the preceding glacial period when the Red Sea dried up and a land bridge was created between East Africa and the Yemen along a land bridge that is now the Bab al-Mandeb Strait.